Cut down the time you spend on-site with an intuitive interface - Windows, Mac & iPad ready. Generate your homeowner report in minutes not hours. Rapidly identify the most important upgrades, and improve communication with homeowners. Transform your homeowner report into a powerful sales tool. Acknowledge homeowner concerns and address them with clear upgrade solutions. Add your own custom recommendations. "Click Here to learn about all the upgrades in version 3! Or attend a free live webinar. 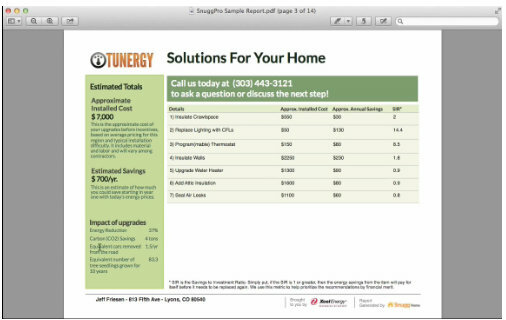 SnuggPro is a cloud-based laptop and iPad sales tool for residential contractors and energy auditors. SnuggPro is the all new successor to iAudit Pro. Compatible with web-connected Windows, Mac and iPad.